"I Accept Blame For Maina’s Return To Office"
More light was shed yesterday on how fugitive Pension Task Force chairman, Abdulrasheed Maina returned to office in the federal civil service. Ministry of Interior Permanent Secretary Abubakar Magaji owned up to the lapses in Maina’s reinstatement, which sparked a huge row. Magaji spoke when he appeared before the House of Representatives Ad hoc Committee investigating the “disappearance, reappearance, reinstatement and promotion of Maina’’ in Abuja. According to him, the reference letter made to inform the Head of Civil Service of the Federation that Maina resumed duty was a letter sent to the Federal Civil Service Commission. “When I observed this upon resumption from sick leave, I quickly replied to the Head of Civil Service of the Federation, Mrs Winifred Oyo-Ita, apologising to her about the reference letter. “But service is an institution; whatever happened in the process of the minutes, the permanent secretary is the head of the administration and I am here to take responsibility. “Whatever the Interior Ministry has done wrongly in accordance with the way administrative matter has been done to the end of this matter, I take responsibility because I cannot reject. “I am the permanent secretary, head of administration and I take responsibility for any administrative wrongdoing that Ministry of Interior has done,’’ Magaji said. Mrs. Oyo-Ita insisted that the ministry acted in error on the issue. She said Maina’s reinstatement letter was not endorsed by the Head of Civil Service of the Federation and the letter of posting not delivered to him. According to her, the Ministry of Interior did not wait to get posting directives from the Head of Civil Service but it went ahead to act on the advance copy issued by the Federal Civil Service Commission. Mrs. Oyo-Ita insisted that Maina was not reinstated into the service. “The Federal Civil Service Commission considered the administrative aspect of the case which is punishable by dismissal and the letter reinstating Maina has not been delivered. “Therefore, he stands dismissed and was never reinstated into the service,’’ she said. Attorney-General and Minister of Justice Mr Abubakar Malami said his office had begun an investigation into the letter directing Maina’s reinstatement. Malami said though work was in progress over Maina’s demand to be reinstated based on court judgment, “the letter of his reinstatement may not have emanated from my office as at Oct. 5, 2017’’. He maintained that he neither authored nor signed letters purported to have emanated from his office directing the Federal Civil Service Commission to reinstate Maina. “The request for Maina’s reinstatement as submitted to my office by Maina’s lawyers was a work-in-progress as at Oct. 5, 2017,’’ he added. He told the committee that he had set up a panel of enquiry headed by the Solicitor-General and Permanent Secretary in the ministry to investigate issues revolving around the letter. The chairman of the Committee, Rep. Aliyu Madaki, issued a one-week ultimatum for the submission of the committee’s report. 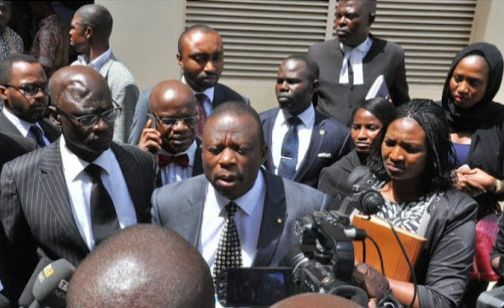 “Concerned about investigation that the letter may not have genuinely emanated from his office, the committee will like the probe concluded and the report sent to us soon,’’ Madaki said. Acting chairman of the Economic and Financial Crimes Commission (EFCC) Ibrahim Magu told the panel that Maina never handed over any asset to the commission. Magu said the assets in the EFCC custody were those recovered by the Commission in the course of investigating the pension fraud. “Maina has no asset he handed over to the EFCC, and if there is any, we will like to know the type of assets, the locations, date of handing over and which officer signed the handing-over documents. “So, there can’t be any asset to be shared by the EFCC, and if there was any sharing, we would also like to know when, where, and who participated in the sharing,’’ Magu said. Magu denied the letter vacating the stop order, saying he had never seen it. He also said he had never met Maina. He said the source of the letter will be investigated because he assumed office in November 2015; “stop order” vacation letter was written in December without his authority. He told the Committee that investigation of pension fraud began in 2010 but that the EFCC had no collaboration with Maina’s team, except for a biometric exercise. “All recovered assets at EFCC are products of our independent investigations and they were police pension and HoCSF. “From police pension, eight people and associated companies were investigated while HoSC had five and associated companies investigated. “All assets recovered from HoCSF on interim forfeiture have been handed over while some are used as offices. “It is only the asset of one Yusuf that has been convicted that’s been permanently forfeited and they are 32 in number. “Maina’s assets that we recovered were seven in Kaduna, five in Abuja- two in Kado, two in Life camp and a sprawling one in Jabi”. Magu said the EFCC was investigating four companies used by Maina with six bank accounts that have N2.7b from 2008 to 2013. According to him, one of Maina’s son’s account that has N1.5b turnover within a year was also uncovered. He said Maina used cash converted to forex exchange for transactions most of the time, adding that he paid $2m cash for the Jabi house. He said having declared Maina wanted, the Interpol has been alerted for his arrest. “Today, the Attorney General of the Federation and Minister of Justice, Mr. Abubakar Malami (SAN) was unable to produce any evidence that Mr. Abdulrasheed Maina handed over 222 properties to the EFCC. Department of State Services (DSS) Director-General Mamman Daura said he was notified of the Dubai meeting between Maina and the AGF with the National Security Adviser (NSA) Babagana Monguno in attendance. He blamed the Maina saga on lack of inter-agency collaboration and information sharing. But when the chairman of the committee was set to round off the hearing, Maina’s lawyer Sani Katu protested that he had been denied a fair hearing. “We must be heard, that is what they did to us in the Senate, they boxed us into a corner. We must be heard,” he shouted. Madaki said no one would be denied hearing adding that the Committee would not allow a rented crowd to disrupt its activities. Katu then reiterated that Miana was reinstated by the court judgment that vacated his arrest order, that the status quo should remain. He insisted that Maina remained on the payroll of the government, going by the court pronouncement and should be paid his emoluments. Katu said Maina should not have been dismissed from service, going by the pronouncement of the court. He also said, out of court settlement was reached by the two parties where it was agreed that Maina would be reinstated while he would drop the N2.1b claim he asked for in the suit. “There is a judgment from the Federal High Court that sets aside the Warrant of Arrest, that sets aside the warrant of arrest which led to his query and subsequent dismissal. “So, our position that having set aside all those queries and dismissal, it means Mr. Abdulrasheed Maina should revert back to his earlier status and what is that earlier status? “The status is that before he was dismissed, he was a civil servant and, being a civil servant, the question can as well be raised if he is entitled to salary and the answer is yes, that as a federal civil servant, he entitled to his salary. “At one point, efforts were made to calculate his salaries from March 2013 till date, perhaps if not for what has happened now, they would have paid him salary in October. “So, we are talking on the premise of the dictates of the law and the law is made up of facts and the facts are contained in the judgement of the Federal High Court,” he said. Adjourning the hearing indefinitely, Madaki warned that it was the duty of the House to prevent impunity in government.